This video, from May 2008, takes you inside the walls of one of the worst prisons in the Western hemisphere. It's not the toughest prison in the world, but overcrowding, poor sanitation, and a general lack of funding in Haiti's National Penitentiary have led to exorbitant HIV and Tuberculosis rates. Reporter Antigone Barton and videographer Stephen Sapienza take a first-hand look at these conditions and an American doctor working to correct them. After this video was taken, USAID authorized $110,000 in emergency funding for health and sanitation improvements. con frecuencia casi semanal continuan arribando a la habana deportados personas del grupo de los "excluibles"﻿ . Candice Cashman holds a picture of her children, drawn by her friend Jacinto Garcia Garcia, who is currently at the Niagara Detention Centre under a removal order. Wearing the bright orange jumpsuit of a prisoner, Jacinto Garcia Garcia walked into the small room at the Niagara Detention Centre and picked up the phone. "I'm in limbo here," he said, as he looked out through the inch-thick Plexiglas and heavy steel bars that separate prisoners from visitors. Garcia has been in jail for years while authorities in three countries decide what to do with him. He was convicted of the sexual assault, assault and criminal harassment of his now ex-wife. But five years later, he's still there. Garcia said he initially left Cuba Jan. 2, 2007, hoping for a new life away from the persecution he feared in the communist country. He said he was one of dozens of others who crowded onto a small ship to escape the country. He eventually made his way to the U.S., he said, where he was granted refugee status. Garcia remained there for a year and a half, until he crossed the border into Fort Erie for a vacation to visit friends. In April 2009, he married Dawn Colson. Less than a month later, Garcia was arrested and later convicted of assaulting her, and locked up in the Niagara Detention Centre. Garcia was originally due to be released Feb. 9, 2011. Now, more than three years later the 41-year-old is still being held in maximum security at the Thorold prison. He's been in custody so long, he has also served the three years of post-release parole while still behind bars. On March 8, 2011 after he had served his initial sentence, Garcia said was loaded on a bus and taken into the U.S. — deported by Canadian immigration authorities. But when he arrived in the U.S., Garcia said he was promptly put in an American jail where he remained for three months before being shipped back to Canada. He's been at the Niagara Detention Centre ever since. "I was put here forever," said Garcia, who said he learned to speak English during his incarceration. "I want to get on with my life." Canada Border Services Agency spokeswoman Nancy Thomson confirmed "Garcia is in detention and is under a removal order." She said the Immigration and Refugee Protection Act allows border authorities to detain people when the officer has reasonable grounds to believe a person cannot be admitted into Canada, although their decisions are assessed regularly by the Immigration and Refugee Board. Garcia's next monthly detention review hearing is slated for Wednesday. While several of his supporters hope he might finally be free, Garcia wasn't overly optimistic. He said he feels "like a volleyball," lobbed from one government agency to another as he strives to regain his freedom. Charles Hawkins, a spokesman from the Immigration and Refugee Board, said it's rare for someone to be left in prison for years as a result of immigration detention. He said there are only about eight people in all of Canada who have been detained for more than three years under those circumstances. "Immigration detention is not meant to be punitive. And it cannot be indefinite," Hawkins said. He said he knows of other people who have been held as a result of an immigration detention for as long as seven years. During Garcia's Jan. 17 detention review hearing, Immigration and Refugee Board presiding member Ken Thomson discussed the issues that have kept Garcia locked up. "The problem with dealing with foreign governments such as Cuba is they do things at their own time, and we cannot. The Canadian government cannot control when they will give an answer," he told Garcia during the hearing, conducted via telephone. "Now, although you've been detained for a lengthy period of time it does not mean indefinite detention. 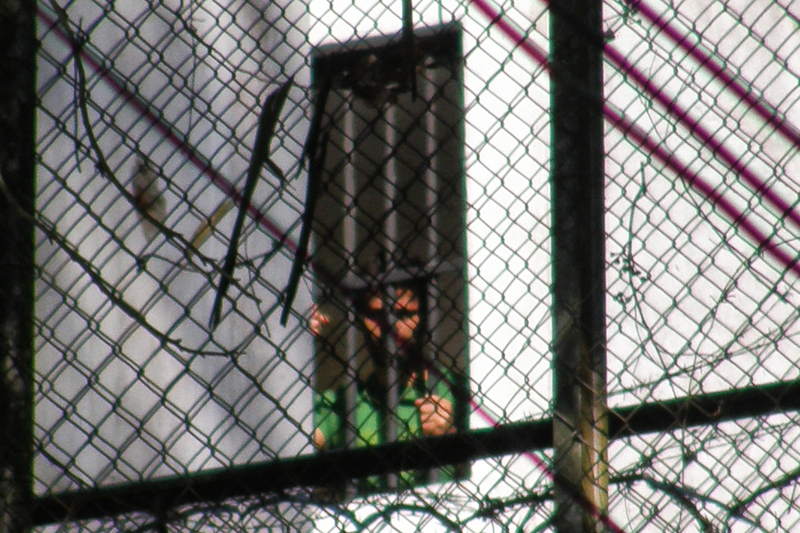 The case law does not specify a period of time as to what constitutes indefinite detention." Although Thomson said the length of time a person has been detained was taken into consideration, "lengthy detention, even for a period greater than two years, in itself will not support a finding of release if there are other reasons to support continued detention. "In your case, the criminal activities involve violence and sexual convictions referred to in the Immigration and Refugee Protection Act, and it's been determined that conditions of release will not sufficiently negate the danger, and can be supported for a decision for continued detention even though detention has been lengthy," Thomson told Garcia. At Garcia's March 12 hearing, he will be represented by Lily Tekle, a staff lawyer from the refugee law office at Legal Aid Ontario. Tekle won't comment on his case due to the pending hearing. "Unfortunately at this time, I don't think I feel comfortable communicating with you only because proceedings are still pending and we are making efforts to potentially work on a release plan for Mr. Garcia," Tekle said in a voice-mail message. Fort Erie resident Candice Cashman is one of several people who have agreed to act as a surety for Garcia if he is released. "I have a lot of people who want to be responsible for me," Garcia said. Cashman has no concerns about vouching for the man to whom she was once engaged. "He never once was violent. He never once was aggressive," she said. "I wouldn't even question whether he would be a danger to me or my children." While Cashman is confident Garcia poses no danger, Colson said she remains fearful of him. And since Garcia has already served his parole while in custody, Colson is concerned that if he's released in Canada there would be no way to ensure her safety. "That's kind of the issue. We're trying to figure out how to best be protected if this happens, but there's nothing there," she said. Although she could get a restraining order against him, she said that will likely take months before it's approved. If Garcia is released in Canada, she said, he won't even have a parole officer checking in on him. Welland MP Malcolm Allen has taken an interest in the case over the past few years, advocating on behalf of Colson, his constituent. "If you have a right to be in the country, then you have a right to be released. But in Mr. Garcia's case, he was deported to the United States. He has no right to be in the country at all," Allen said. "The difficulty is finding a way to deport him back to Cuba." Allen said he's discussed Garcia's case with Cuban authorities, and "the difficulty is that Cuba doesn't seem to want him." Nevertheless, Allen and Colson agree that the situation needs to be resolved. It costs Canadian taxpayers about $111,000 a year to keep a male prisoner in custody, according to information published a year ago by the Office of the Correctional Investigator. "They cannot hold a person indefinitely," Colson said. "But he's here in prison and something needs to get done. He can't be left in limbo." Ideally, Colson is hoping Garcia will finally be permitted to return to Cuba. "I think it would be best for everyone, and in everyone's best interest -- for myself, my family and several of my friends "¦ and it would be very beneficial for Mr. Garcia to go back home and be around his own family as well," Colson said. "I hope for everyone that it will happen." But Garcia fears what might await him if he returns to Cuba. Garcia said he could be thrown in prison in that country for having spoken out against the Cuban government. Garcia said his father, Jacinto Garcia Sr., criticized the Cuban government years ago. His father was taken to a military hospital and never came home, Garcia said. Blaming the government for his father's death, he said he began speaking out against the government, too. "My family told me the government was going to put me in jail for 30 years," he said. Garcia made it clear at his last review hearing in February that he does not want to return to Cuba. "If you have problems, political problems in Cuba, I don't agree with the communists and I don't want to be repatriated. If I'm here it's because you want to deport me, then you can deport me. But that doesn't mean that I want to be repatriated," he told immigration officials. Cashman also fears for Garcia's safety if he returns to Cuba. "For him to go back, yes, they would essentially throw him in jail if not kill him," she said. "It's not safe for him to return there." In the meantime, Allen has been working with Colson to develop a private member's bill in the hope of getting more access to information about the status of people involved in immigration cases. Under current legislation, Colson said much of the information concerning Garcia is confidential. "Even if he gets released, no one is notified of where he is. Even if he gets deported, I don't get to know," she said. Advocates for the rule of law in China won a victory two weeks ago when the most Kafkaesque aspect of the country’s penal system was officially slated for abolition. The system of laodong jiaoyang, or laojiao for short, translates, innocuously enough, to “re-education through labor.” In practice, laojiao is a system of punishment for misfits -- from drug addicts to political critics -- whose rehabilitation is deemed to require years of forced labor without the benefit of a trial or even a chance to hear formal charges. It is a remnant of Maoist Communism that is entirely at odds with the country’s contemporary capitalist sheen. When the Chinese Communist Party plenum, an annual conclave of top leaders, announced its intention to do away with the system, it was rightly considered a major test of new president Xi Jinping’s determination to reform the country’s political system. But it is far too soon to conclude whether he has passed the test. Xi’s decisions at the recent plenum -- which included creating high-level commissions to coordinate foreign policy, domestic security, and economic reform, strengthening the market and shrinking the state’s role in the economy, and easing the one-child policy -- have mostly served to clarify the battle lines in the Chinese political establishment over issues of reform. In the case of laojiao, those battle lines are especially entrenched, given that they were drawn in the beginnings of China’s Communist era. HANGZHOU, China (Reuters) - China plans to end its controversial practice of using the organs of executed prisoners for transplants by around the middle of next year, a senior official told Reuters on Saturday. China is the only country that still systematically takes organs from executed prisoners for use in transplant operations, a decades-long practice that has drawn widespread international criticism. Beijing said in August it would begin to phase out the practice this month, and health officials have previously said China must stop using dead inmates' organs to "build a positive image that benefits the country." By mid-2014, all hospitals licensed for organ transplants will be required to stop using organs from executed prisoners and only use those voluntarily donated and allocated through a fledging national system, said Huang Jiefu, former deputy health minister who heads the organ transplant reform.